Glaucoma is a group of diseases that can damage the optic nerve in the eye. If left untreated, glaucoma can cause permanent vision loss or blindness. This information is about primary open-angle glaucoma, the most common form of the disease. Clear fluid flows in and out of a small space at the front of the eye called the anterior chamber. This fluid bathes and nourished nearby tissues. If this fluid drains too slowly, pressure builds up and damages the optic nerve. Though this buildup may lead to an increase in eye pressure, the effect of pressure on the optic nerve differs from person to person. Some people may get optic nerve damage at low pressure levels while others tolerate higher pressure levels. 3. Who is most likely to get it? At first, there are no glaucoma symptoms. Vision stays normal and there is no pain. But as the disease gets worse, side vision may begin to fail. Objects straight ahead may be clear, but objects to the side might be missed. When glaucoma symptoms are left untreated, the field of vision narrows and objects in the front can no longer be seen. Glaucoma is found most often during a dilated eye exam. In this procedure, drops are put into the eyes to enlarge the pupils. The eye care professional is then able to see more of the inside of the eye to check for signs of damage. 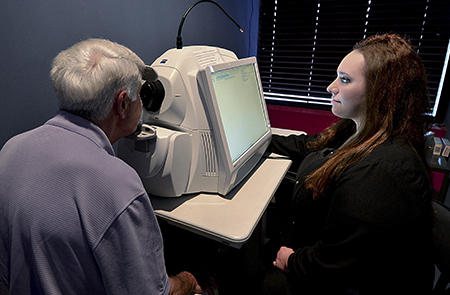 The eye care professional will also measure eye pressure during the exam, but that alone does not detect the disease. 6. How can it be treated? Medications: These may be in the form of eye drops or pills. Some drugs will help reduce pressure by slowing the flow of fluid into the eye. Others help to improve how the fluid drains. For most people, regular use of drops or pills will control the pressure inside the eye. But they may stop working over time, or they may cause side effects. If a problem occurs, an eye care professional may select other drugs, change the dose, or suggest other ways to deal with the problem. Laser Glaucoma Surgery: During laser glaucoma surgery, a strong beam of light is focused on the part of the eye where the fluid drains, resulting in a series of small changes that make it easier for fluid to exit the eye. Over time, the effect of laser glaucoma surgery may wear off. Patients who have these forms of glaucoma surgery may need to keep taking medications. Glaucoma Surgery: Glaucoma surgery can also help fluid drain from the eye and reduce the pressure. However, glaucoma surgery is usually only used for patients whose pressure cannot be controlled with eye drops or laser glaucoma surgery. 7. What can you do to protect your vision? Early detection and treatment are the best ways to control glaucoma before it causes major vision loss. If you are in one of the groups at higher risk, be sure to have your eyes examined through dilated pupils every one to two years by an eye care professional.